In-flight Wi-Fi provider Gogo on Thursday reported that iOS users account for the lion's share of mobile devices accessing the company's ground-to-air Wi-Fi network, with iPhone owners comprising some 73 percent of all traffic originating from smartphones. According to Gogo, an in-flight Wi-Fi provider operating on 1,800 aircraft across ten carriers, including United, Delta and American Airlines, some 84 percent of all mobile devices connecting to its service have been identified as running Apple's iOS. 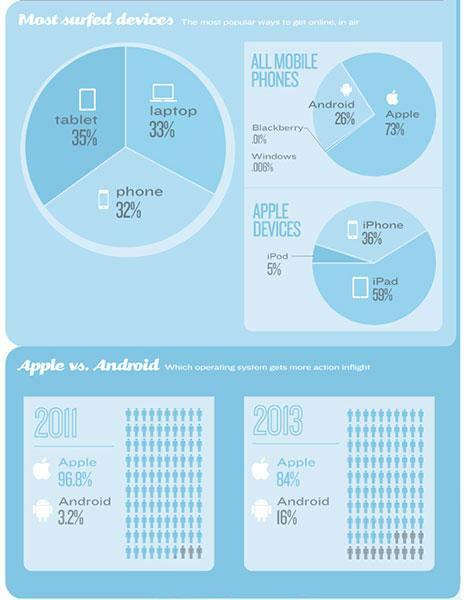 Products using rival operating system Android account for the remaining 16 percent. While iOS still rules the skies, the OS saw a decline from a 96.8 percent share in 2011, while Android use grew 400 percent over the same period. Breaking down the statistics by device, smartphones and tablets combine to make up 67 percent of portables being used to access the internet in-flight. Tablets enjoy the most use with a 35 percent share, while laptops and smartphones comes in at 33 percent and 32 percent, respectively. Apple's presence is dominating, with the iPhone accounting for 73 percent of smartphones recorded, compared to Android's 26 percent. Handsets running on BlackBerry and Windows didn't break the 1 percent mark. Gogo said that passengers spend most of their time surfing the Web, with Apple's Safari being the most used browser, followed by Microsoft's Internet Explorer and Google's Chrome. Other Internet activities ranking high on the list of things to do while traveling include writing emails, accessing social media sites, checking sports scores and shopping.